These are important songs by an indispensable composer, realized with one of the most striking performances of a male singer caught on disc in the past year. This exceedingly successful production offers interesting insight into the Lied oeuvre of Einojuhani Rautavaara. His songs cannot be better performed than by Gabriel Suovanen with Leif Segerstam and the Helsinki Philharmonic. Baritone Gabriel Suovanen sings all of this music with warm tone and great musical intelligence, and he couldn't be better accompanied than by Segerstam and the Helsinki Philharmonic. A beautifully produced survey of Rautavaara's songs. (...) Ondine's sound, as ever, is first rate. This production combines half a century of musical poetry. (...) A wonderful, sometimes even dreamlike recording, which requires much calm from the listener, but gives back to him at least as much calm and beauty. 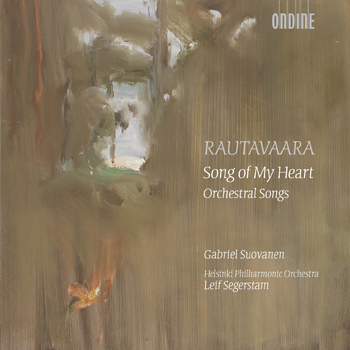 This is the first anthology on CD of Finnish cult composer Einojuhani Rautavaara's orchestral songs. Rautavaara composed these Shakespeare and Rilke songs in his twenties but revised them later and in recent years when he reaffirmed his love of literature and poetry. The religious and metaphysical dimension in his music is manifest in the song cycle God's Way, a setting of Swedish poetry by Bo Sitterlind. The three final songs are Rautavaara's own excerpts from his opera Aleksis Kivi and employ texts by the great Finnish poet. Baritone Gabriel Suovanen is accompanied by the Helsinki Philharmonic Orchestra and their Chief Conductor Leif Segerstam, who have a lengthy pedigree in their compatriot's music.